Sydney's an expensive place, even for those of us who live here. But there's a lot of cheap or free things to do and the majority of things to see in Sydney are outdoors and free! Here's our guide to making your budget stretch a bit further with some great, but cheap things to do. The public ferry to Manly gives you a great trip on the harbour for a fraction of the price of taking a cruise. Granted, you won't get the commentary, but you still get the best views and a great feel for this beautiful harbour city. Plus you finish in Manly, a really nice beachside suburb. Once you arrive take the short 15 minute walking trail to the lovely Shelley Beach, look out for the Eastern Water Dragons along the way. Shelley has some of the best snorkelling in Sydney, another great free activity. It's BYO snorkel though. Bonus points if you go on a Sunday and get the $2.60 fare. Rather than pay to go up the Sydney Tower, head to 360 Bar and Dining and have a drink instead. The bar is located in the tower itself and revolves to make sure you get the best views from every angle. You’ll have to meet a minimum spend of $20 per person, but for less than the cost of a tower ticket ($28) you’ll get the view with a great cocktail as well. 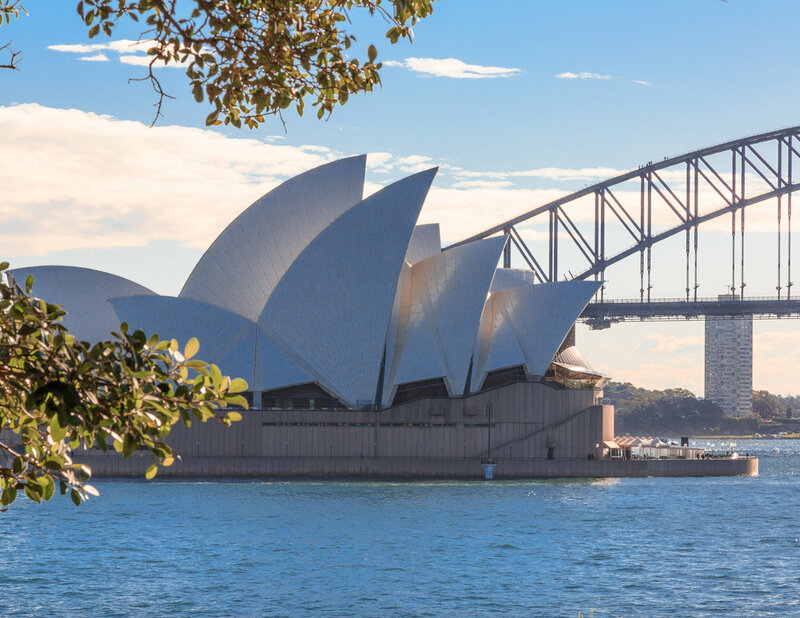 The majority of Sydney’s museums require an entry fee, however the Museum of Contemporary Art (Circular Quay), Art Gallery of NSW (Hyde Park) and The Rocks Museum (The Rocks) are all free. The Museum of Contemporary Art also has a brilliant café at the top for panoramic views of Circular Quay. Sydney also has a thriving street art scene, which is well worth checking out and will take you to some of the less visited parts of the city. Bondi Icebergs offers a world famous view and most people associate this with the fine dining restaurant. However, you can go to the RSL next door instead and get the same view. You get the same view at a fraction of the price. For some of the best views of the Opera House and the city, head over the footpath on the Harbour Bridge. You'll get a view of Sydney from a decent height plus you'll get up close to one of Sydney's major landmarks. If you only want to walk across it once, you can get a train at Milson's Point or a ferry from Luna Park Wharf back into the city. A beautiful place to get some great views of Sydney in one of the biggest parks in the city. It also includes Mrs MacQuarie's chair, a great sunset view of both the bridge and opera house. Starting at the opera house, you can follow the path by the water to Mrs MacQuarie's chair. Once there, you can carry onto Woolloomoolloo (points for pronouncing that one after a few beers) and finish at the wharf for a cold drink. Sydney is famous across the world for having stunning beaches within a few kilometres of the city centre. Whether you want the prestige and bustle of Bondi, or the solitude of Garie Beach, there's a patch of sun and turquoise water waiting for you. If you can't decide which one is for you, then check out our 10 best beaches in Sydney. This is our favourite thing to do in Sydney and the bonus is that it's free! Sydney is a harbour city and in our opinion, the best things to do are outdoors. The walks within the city are excellent and incorporate incredible views while seeing some of the most famous sights. Bondi - Coogee Coast Trail - One of the best coastline walks you'll ever do. Starting at the Iconic Bondi Beach, you'll cross cliff top trails to several other beaches before finishing at family friendly Coogee Beach. The path is paved and although there are a few steps, it's an easy 5.5km trail. There's also a couple of stops along the way for lunch or some very good coffee. Take your bathers and don't forget to look out for dolphins from the cliff tops. Spit Bridge - Manly - A favourite with Sydney locals, this walk has a mix of beach, bushland, big views and it finishes in the beautiful beach town of Manly. It also has some aboriginal rock engravings along the way. Catch a bus from the QVB building in the city, getting off at Spit Bridge to start the 10km trail. It's a relatively easy walk, but still has some uneven paths and small inclines. There are plenty of places to take a swim during the walk or when you arrive in Manly. Barranjoey Lighthouse - So this is a pretty short walk, only about 15 minutes from the beach to the lighthouse, but it offers one of our favourite views in Sydney. From the top you look down on a magnificent view of Palm Beach and the surrounding area. If you're lucky, you can see migrating whales between May and October. If this isn't enough walking for you, then check out our guide to the best ones just outside of Sydney. Granted, hotels and flights during this time won't be cheap, but in return your evening activities will be sorted. For three weeks between the end of May and mid June, Sydney lights up for Vivid, with incredible projections on all the famous landmarks in the city. There are no fees and most sights are walkable. In our opinion it's the best festival in Australia. It has become really popular so if you are very keen on photography it is best to go after about 9pm on a week day, it will still be busy but not as packed as earlier in the evening. Sydney has several pools that have incredible views. Whether you choose the Olympic pool's view of the Harbour Bridge, Iceberg's view of Bondi or one of the ocean baths that overlook the beach, you'll be in for a treat. By far the cheapest way to get around now is by Opal Card, which can be used on all public transport. The scheme allows you to travel at half price for the rest of the week once you've made eight journeys. You can visit most of the sights using the train, ferry or buses. The most convenient place to buy an Opal Card is at a newsagent, but train stations also sell them. Coupled with your Opal Card, Sunday Funday allows you to travel all day to anywhere on the train, ferry or bus network for $2.60. This means you can get a train to the Blue Mountains, Newcastle or anywhere that takes Opal Cards and back for $2.60 per person. Want to stay closer to the city? Use this opportunity to take the Manly ferry for a fraction of the usual cost. ($8.90 each way with Opal). Although this isn't a cheap thing to do, it's a cheaper way to do the things you want. There's one place in Sydney we always go to as it's cheaper than all the rest. They're not based at the airport, but so long as you can get to Kings Cross you'll save yourself some money for any day trips. No Birds offer packages from $25 per day. All cars are nearly new Toyotas and we can vouch for them being a reliable company. This is also the best way to get to Royal National Park which has exceptional bush walking tracks and cliff top views or the Hunter Valley for the wineries. Don't ask us why, but petrol prices in Australia fluctuate drastically between midweek and weekends. Although petrol is half the price of Europe, you'll find yourself paying 10-20c per litre more if you fill up at the weekend. If you've been to Coles or Woolworths supermarkets you can get some further discounts, save your receipts. Sydney isn't great at free wifi. Few places offer it and those that do are expensive and slow. Our suggestion would be to buy a local sim and get yourself super fast 4G data for as little as $10. It's not only quicker than most wifi in Australia, it will also enable you to make free calls (most plans include free national and international calls) to organise everything. The main providers are Telstra and Optus. Optus tends to be cheaper though Telstra has better overall coverage. Have you been to Sydney? What are your favourite money saving tips? Let us know in the comments! The Walls of Jerusalem isn't for the faint hearted: it's a 800m climb across a 20km return hike! Check out why this is one of our favourite hikes in Australia. All the best accommodation in Alice Springs for every budget! High-end, glamping, mid-range, hostels or budget, we’ve got you covered. The best places to stay in the Blue Mountains for any budget: hotels, guesthouses, rentals, cottages and several hidden gems spread all across all areas in this stunning National Park.